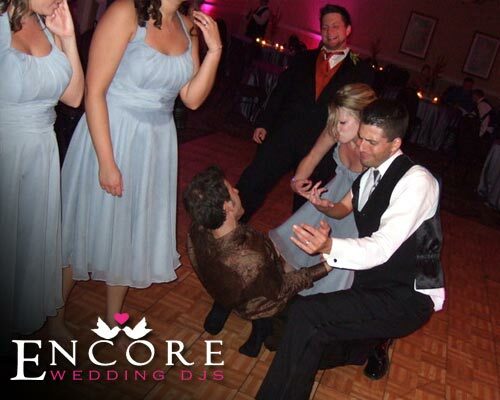 We did weddings back to back at the Embassy Suites Hotel in Livonia Michigan (I guess that this city loves Encore!) Lisa and Mario had us provide the DJ entertainment and lighting design for the duration of the reception. I must say, this room looks awesome with 20+ fixtures setup. We even had the room match the same colors of their center pieces. They gave us all excellents in the Satisfaction Survey. Best memory of this wedding was the dance floor packed with us mixing MJ (Michael Jackson) into JT (Justin Timberlake).